Funny business can be smart business. From principals to priests, real people – not actors – have trusted my satirical video concepts to reveal a more relatable lighter side of themselves and of their organizations. What’s funny within your organization’s culture? Who can make your employees or clients laugh? Working closely with you, I’ll find out. And together, we’ll make ‘em laugh. 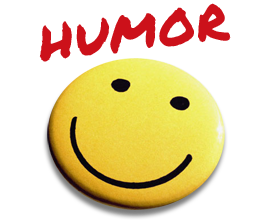 What message, concept or observation could your organization disguise through humor? Readers have embraced my fun and funny essays published by online entertainment and news organizations around the nation. Are you partnering with writers who have accomplished the nearly impossible?After running a marathon, I convinced myself I could do anything. So I worked to realize my life-long dream of writing a book, published by a national publishing house. 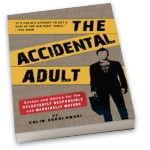 On the humor shelves of the top bookstores from Los Angeles to New York City, The Accidental Adult revealed my reluctant journey to responsible adulthood, as I kicked and screamed along the way. The book has been referenced or reviewed by a host of media outlets, including MSNBC.com, The Huffington Post,Canada’s National Post, Minneapolis Star Tribune, St. Paul Pioneer Press, Minnesota Parent and SheKnows.com. When you show others you’re in on the joke, you become more relatable, more credible, more human.